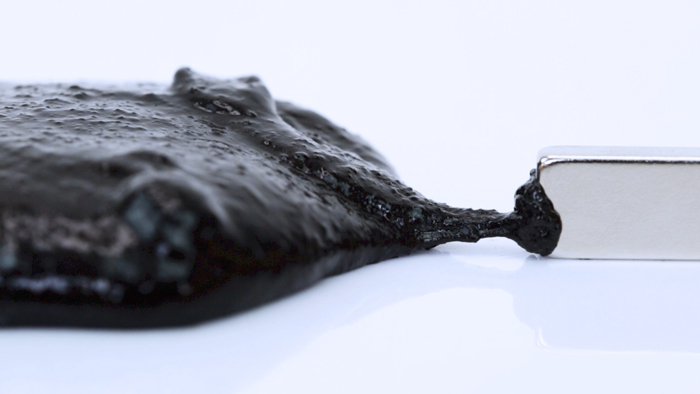 Magnetic slime is really, really creepy….and I mean that literally! This slime is like a substance from another planet, the way it behaves is strange and wonderful and I’m excited to add it to our list of slime recipes here on the blog. You need to use neodymium magnets. 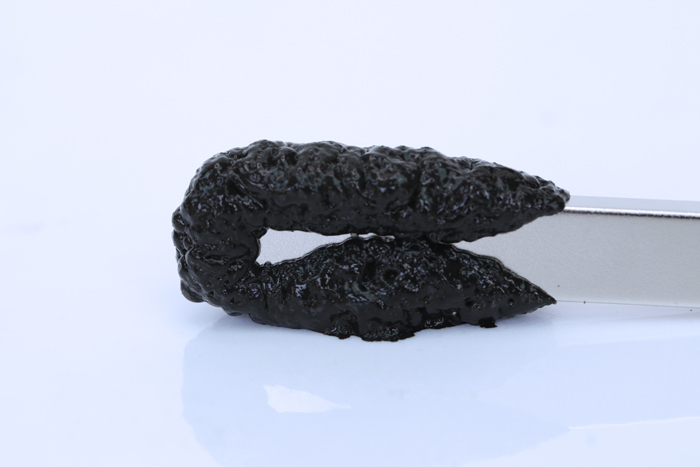 These are rare earth magnets that are very powerful. They are also very dangerous if swallowed. I have started using large rectangular neodymium magnets so no one is ever tempted to put put it in their mouth. Please NEVER do this project with kids who are prone to putting things in their mouth. Kids should be warned of the safety issues. It’s not as easy as out looks to manipulate. Guiding strands of slime through the air using the force of magnetism is not as easy as some magnetic slime videos look. Consider yourself warned! It rusts. In a day or two this slime will turn brown with rust. Don’t expect it to last long. I think of it as a one day only type of slime. This slime consumes magnets. Yup, as in the magnets are quickly attracted to and surrounded by the slime. It is so cool to watch! It looks like some type of alien gobbling up magnets. You can watch it in our video below. Kids LOVE making it! We recently made this in a workshop and attendees really really enjoyed playing with this slime. In fact, the kids showed us the trick of placing the magnet in the slime to watch it disappear! Neodymium magnets are extremely dangerous if swallowed. I recommend using this size. Also these magnets are extremely magnet and can pinch you if they are held close to another magnet! Keep individual magnets well separated from each other! The black iron oxide powder gives the slime it’s color and is somewhat magnetic. The iron filings are highly magnetic but make the slime very stiff. 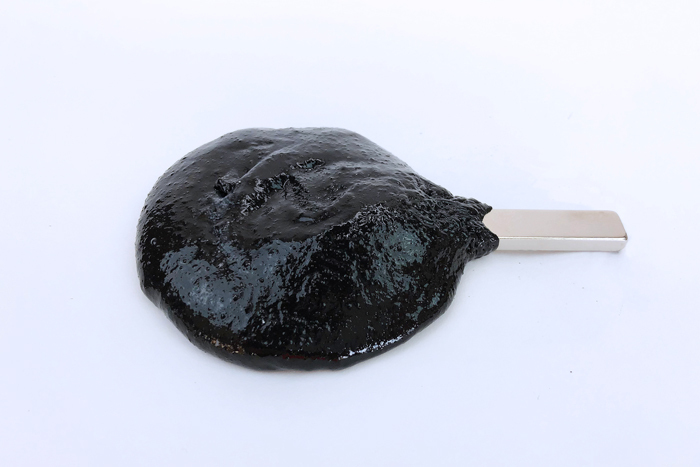 You may omit the iron oxide powder but your slime will be a gray color and may be stiffer than the combination of iron oxide powder and iron filings. Step Two Add 1 tablespoon of both black iron oxide powder and iron filings. Mix well. Step Three Slowly pour in 1 ounce (2 tablespoons) or liquid starch stirring as you add it in. Step Four Once the slime begins to pull away from the sides of the bowl start kneading it with your hands. Knead until it no longer sticks to your hands. If your slime is too sticky add in a little bit of liquid starch and knead. If it is too watery add in a small amount of glue. Note that the metal in this recipe makes the slime stiffer than typical slime with a grainy texture. Step Five Once the slime is mixed it’s time to experiment! Hold a neodymium magnet close to the slime and watch what happens. Now for the good part: Place your magnet on top of the slime and watch it disappear! Storage note: You may store this slime in a small container however it will rust. As soon as rust appears please discard the slime. A polymer is a substance made up of a long chain of molecules that repeat. Glue is a polymer. These chains are able to slide past each other making the glue flow. Liquid starch contains sodium tetraborate. When mixed with glue, the borate ions cross link with the glue’s protein molecules, creating larger molecules that can no longer easily slide past each other and create a thick gooey substance. A magnet is a material that produces a strange, attractive force around it called a magnetic field. This magnetic field attracts other materials that contain iron. 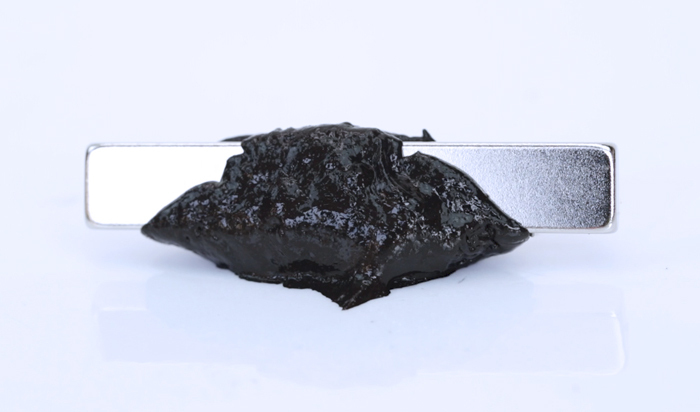 Both the iron filings and the iron oxide powder contain iron and when you place a magnet in our magnetic slime the little bits of iron are quickly pulled towards it. Trapped in our polymer slime, the iron bits are attracted to the magnet but can’t move quickly towards it so they creep slowly around the magnet. This creates the illusion of the slime swallowing up the magnet. Neodymium magnets are a special type of rare earth magnet that are extremely powerful. When iron comes into contact with water, a chemical reaction occurs between the water molecules and the iron, weakening the iron and producing what we call rust, a red flaky substance. The liquid starch contains water which eventually reacts with the iron and turn the slime brown. 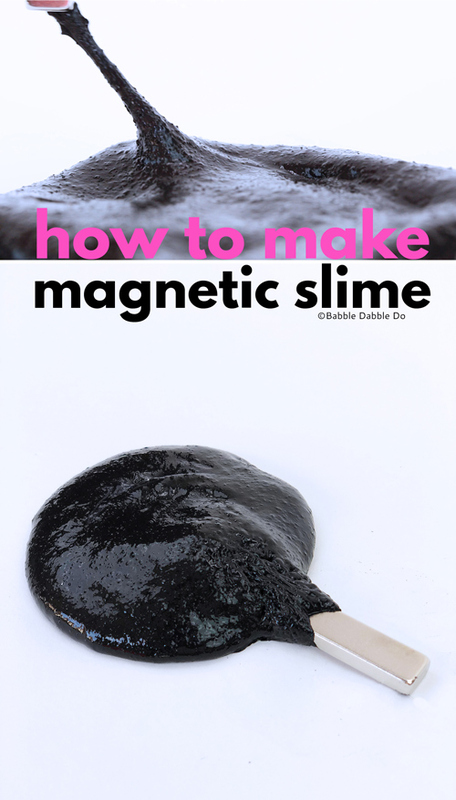 Ask yourself questions There are a lot of interesting things going on with magnetic slime that you can investigate. 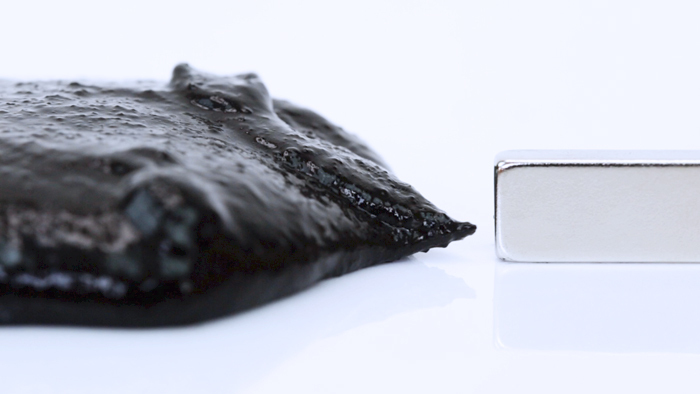 Some question ideas: How do different magnets types (ceramic, neodymium) interact with the slime? 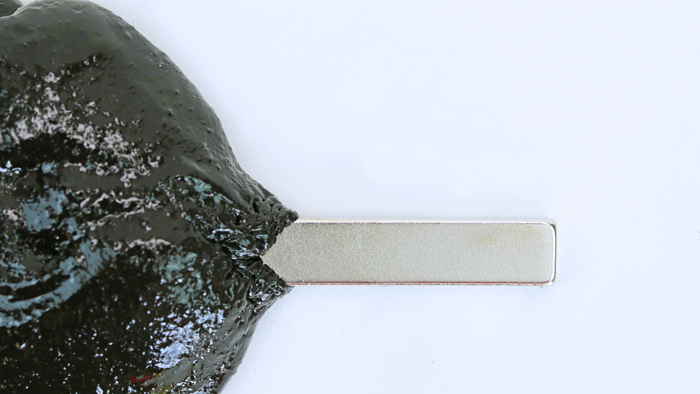 What is more magnetic: slime with just iron oxide or just iron filings, or both? Can you change the recipe to slow down the rusting process? Research Do research online and at the library to try and predict the answer to your question. For instance, read about how to prevent/slow down the rusting process or different magnet types and how strong they are. Make a hypothesis A hypothesis is your prediction of the answer to your question based on your research. It may or may not be true. Experiment! Test you your hypothesis by testing the variables and documenting them. Be sure to take notes of each experiment and what happens; this is called your data. 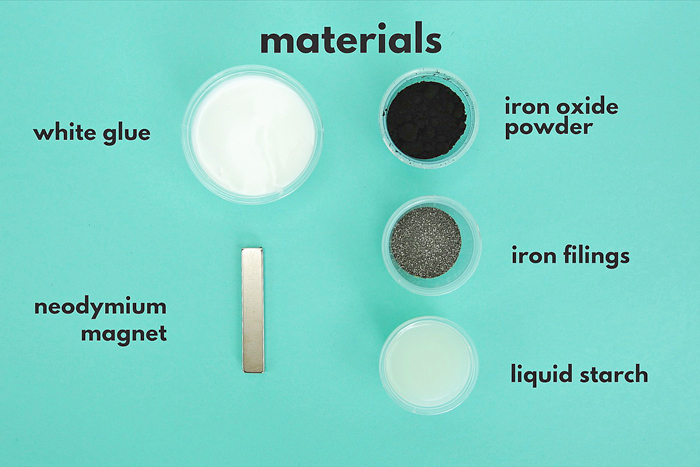 Experiment with the recipe ratios Vary the amount of iron oxide powder and iron filings to see what makes the most and least magnetic slime. Try a batch without iron filings and a batch without iron oxide powder and compare them. Test different magnets Try using ceramic magnets in addition to neodymium magnets. Try different sizes of magnets to see if that makes a difference. Experiment with the rusting process How long does it take to rust? Can you vary the recipe to slow down or eliminate the rusting? If you do send it to me! Ha! Draw a conclusion Based on your experiments form a conclusion. Was your hypothesis correct? Share your findings Create a presentation with your findings. Include your research, hypothesis, the data you collected, and your conclusions. Be sure to include images and samples! 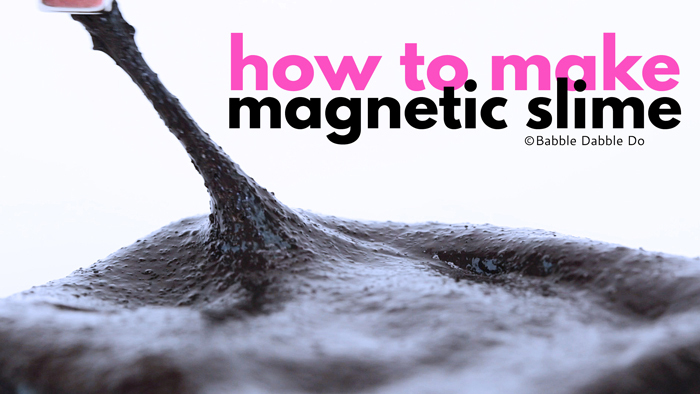 The combination of magnetism and polymers creates the weird and wonderful substance we call magnetic slime! Now you understand the science behind the magical behavior!